Get $ to do something cool with your neighbours! 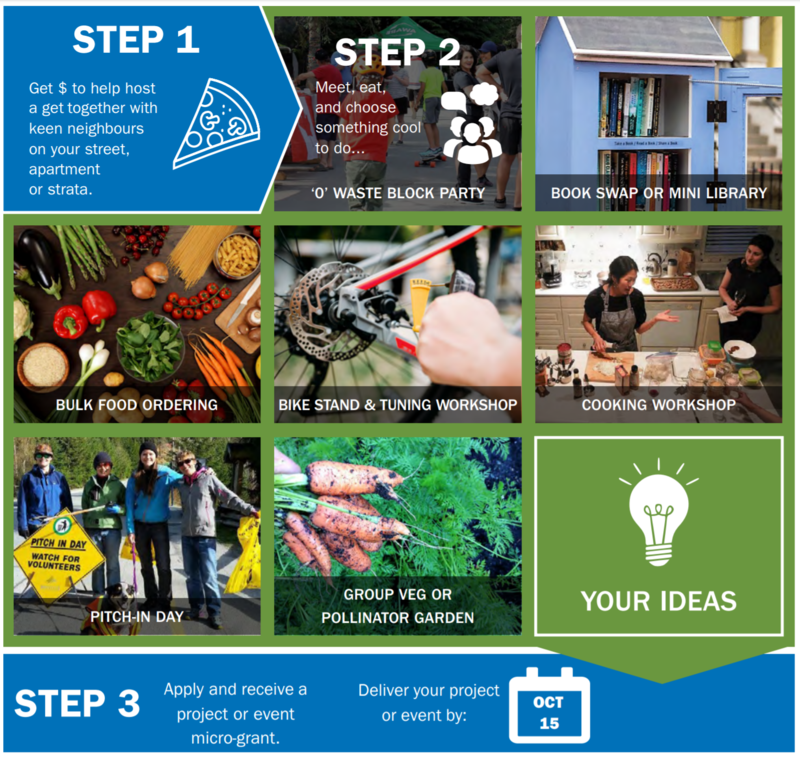 Do you have a project idea that would enhance life on your street or shared property? Do you want to get to know your neighbours better through a fun event? From now until September 15th, Whistler has access to $10,000 in micro-grants from Whistler Resilient Streets to build and then celebrate community in Whistler neighbourhoods! It’s a pilot program that gives neighbours the funds to start street-level conversations with the goal of building greater connections between you and the community that you live in. How do we get the $? It’s as simple as 1…2…3! STEP 1: Download and complete the $50 Pre-Planning Micro-grant Application. STEP 2: Meet, eat and choose a project or event. STEP 3: Download and complete the $200 Project Micro-grant Application. Coordinator Form: Download and print the Coordinator Form to make scheduling a time to meet with your neighbours easier. Fill out the dates and your contact info, then hand these out to your neighbours. Follow up with an email to plan when to meet! By signing up for Whistler Resilient Streets you are part of making Vital Connections in 2018 by building then celebrating our community. Vital Connections combines the community engagement element of the CFOW’s Whistler’s Vital Signs and up to $10,000 of micro-grants from Whistler Centre’s Whistler Resilient Streets to build and then celebrate connections in Whistler neighbourhoods this fall. To engage community and talk about your connections go to Whistler Vital Signs 2018. Stay tuned to our Facebook pages for more information: Community Foundation of Whistler and The Whistler Centre for Sustainability. Resilient Streets Whistler micro-grants include $50 pre-planning grants and $200 neighbourhood project or event grants. Applications are short and administration is simple. Application intake begins at the kickoff event on April 23 and continues to September 15th or until $10,000 in grants are fully subscribed. Please reach out to connectcommunity@whistlercentre.ca if you have any questions about the Resilient Streets program. Resilient Streets is a program of the Building Resilient Neighbourhoods initiative, delivered in partnership in Whistler with the Whistler Centre for Sustainability and a diverse range of local partner organizations and funders such as the Community Foundation of Whistler and the Resort Municipality of Whistler. This is made possible through funding support from PlanH. PlanH, implemented by BC Healthy Communities Society, facilitates local government learning, partnership development and planning for healthier communities where we live, learn, work and play. Working together with health authorities, UBCM and the Ministry of Health, PlanH supports Healthy Families BC, the Province’s health promotion strategy.